A nation that forgets its past is vulnerable to becoming a victim of its future. The events of Friday night in Paris are a reminder to all of us, if ever we needed it, of a changed and rapidly changing world. Our hearts reach out to the people of Paris as they awaken to loss and the recognition that lives have now been changed, not only for those who have been hurt or killed in the carnage of Friday night’s attacks but for the general population at large. Our lives have been changed along with theirs. We have become inured on a daily basis to increasingly frequent reports of terrorist attacks in far-flung places with whom we feel only but a distant connection. Paris changes that. For we are rather frighteningly aware that Paris is also London, New York, or any of our major metropolitan cities. We are linked to the citizens of Paris as we are to those of London through ties of historical and cultural affinity. These form the basis for a human affection that links us to Parisians in ways that we can feel, for when human beings identify with one another, then fear and pain become shared. This is the attack everybody has been dreading for at least a couple of years. This is really important because it is the essence of terrorism, it is not only about people being killed it is about creating a political effect. What worries me most is that we will see in France and other European counties a polarization, with different extremists egging each other on …. trying to take advantage. It’s about dividing societies. This was a big attack but even relatively small attacks are dangerous because of the political situation, because of the chain reactions they cause. On June 28th 1914, in the Bosnian city of Sarayevo, a city situated along the fault-line dividing the Austro-Hungarian and Ottoman Empires. For the nations of Western Europe and America, Sarajevo was a place about which little was known. It was here along the ancient fault-line between the Christian and Islamic spheres of influence that a young Serb nationalist shot and killed Archduke Ferdinand Habsburg, heir to the Austro-Hungarian throne. This single, isolated event triggered a chain of events that ricocheted across Europe, catapulting it into the bloodiest war in its very bloody history. The First World War and the Armistice signed four years later, established the conditions that led into the Second World War and the Cold War, as well as just about every isolated hot war since then. Most of us know from our history books that the event in Sarajevo on June 28th, 1914 led to the collapse of the Austro-Hungarian and German Empires. We may dimly remember that it also caused the collapse of the Ottoman Empire creating the genesis for events that today are playing themselves out, tearing apart the ancient societies of the Middle East. As if we needed further reminding after weeks of viewing the plight of hundreds of thousands of Syrian and other refugees, in Paris on Friday night the consequences of the disintegration of Iraq and now Syria, broke through our mental levees and flooded into our consciousness. With the vacuum left by the Ottoman collapse, as the victors of the Treaty of Versailles, the British and French were able to divide the Middle East into respective spheres of influence. Together, they drew meaningless lines on the map. Palestine, which included modern Israel as well as Jordan, and Iraq were created to be a British sphere of influence, together with the existing nations of Egypt and Iran. Syria and Lebanon were created to become an area for French influence. Both countries supported Ibin Saud to unify the desert tribes of the Arabian Peninsula into the Kingdom of Saudi Arabia. However, it was the creation of Iraq and Syria, little more than arbitrary lines on the map that made so little sense. In the case of Iraq, Bedouin Sunni Arabs were lumped together with Kurds and Shi’ite Arabs. The Bedouin and Kurds shared the Sunni form of Islam but were divided by ethnic identity. The Arabs shared ethnicity but were divided by religious tradition. The Kurds sprawled across the artificial borders of the new Iraq, Syria, Turkey and Iran. The Shi’ite Arabs shared a common religious tradition with their Persian neighbor. In the case of Syria the rest of the Bedouin Sunni Arabs not included into Iraq were lumped together with the urbanized and cosmopolitan Levantine cultures of Damascus and the Mediterranean coast. In Lebanon, Sunni, Druse, Christian and Shi’ite populations were forced into a unitary state. With the retreat of the colonial powers after 1945 and an increasing American influence in the region, the stability of Egypt, Iraq, Syria, and Iran was maintained through Western support for ruthless dictatorships that maintained stability through oppression. Iran was the first domino to fall. We all know the rest of this history and how we come to the tragic events in Paris on Friday night. What we don’t know well enough is how responsible the several generations of Western political leadership is for what we see coming to pass. Violence only begets more violence. No one has clean hands. Wednesday of last week was Veterans Day, which is always the 11th November because at the 11th hour, on the 11th day, of the 11th month in the year 1918, the guns on the Western Front fell silent, bringing to an end the First World War. The Allies celebrated November 11th as Armistice Day, keeping the minute of silence at the 11th hour. In the US Armistice Day was renamed Veterans Day in 1954 following the Korean War. In the UK, the renamed Remembrance Day continues to be marked by the wearing of the red poppy, as it does also in France and Belgium. In these countries remembrance of the war dead grows in strength as a national commemoration with each passing year. The wearing of the poppy has fallen into disuse in the US and the link to remembrance seems to have weakened as the years have past. At St Martin’s we have marked Sunday 15th November as a day of remembrance, a time for the solemn commemoration of the war dead. To these we now must add the victims of terror, both cultural kin and foe. 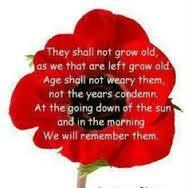 Why keep this morning of solemn remembrance? Well, one answer is the rector is importing his British cultural observances. Yet, the deeper reason lies in a recognition that as our American culture loses the desire to remember, we need to be reminded that what we no longer remember, we are destined to repeat. If violence begets violence, then violence forgotten, repeats itself creating spirals of escalating horror. On Veterans Day, we are quick to express our support for the men and women currently serving in our armed forces. The President pays an official visit to Arlington’s tomb of the Unknown Soldier. Yet, the rest of us seem to have loosened our remembrance of the war dead. We no longer wear the poppy, the symbol of the carnage of war. In the loss of that memory and the customs that keep it alive, we also lose the capacity to move beyond sentimental expressions of support our troops into a more somber contemplation of why we continue to put our young service men and women in harms way. Many of us are left scratching our heads, not daring to voice the question: and for what end? The separate commemoration of Memorial Day, instituted by President Lincoln as a solemn commemoration for all the dead of the Civil War, has now degenerated into just another of the proverbial three-day weekends. The national memory of the sacrifice of our sons and daughters falls lost somewhere between these two commemorations, both of which are now in need of a restoration if they are to fulfill our need for a satisfactory experience of national remembrance. The Old Testament lesson recounts the story of the sacrifice of Isaac. This is a story that comes down to us out of the predawn of the Jewish religion. Recorded in its present form at a much later date and presented as a story about God rewarding complete trust, there are echoes of a more disquieting time when child sacrifice may well have been part of a more primitive Israelite deification of the violence of fear. As is the custom of all such wrathful deities, they require a scapegoat appeasement. For the Fallen, is an ode from the pen of Lawrence Binyon, another young poet serving in the trenches. For the Fallen has become immortalized as the Ode of Remembrance, recited across the British Commonwealth at all Remembrance Day Services. I commend these words to all of us, not only in memory of our own fallen, but in memory of all the victims of terror.